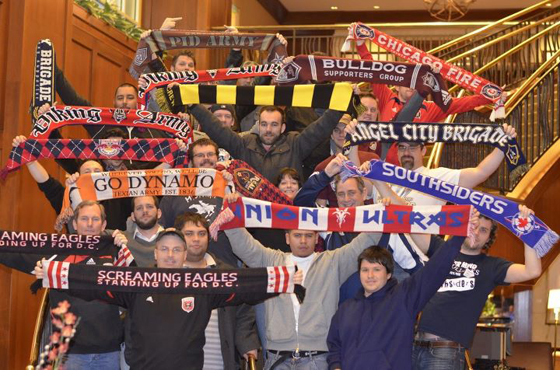 look at all of those hooligans... at lest that's what MLS is wants me to think. I talk a lot on this blog about the progress MLS has made over the last few years. The league has experienced a gradual but noticeable raised profile, and that’s been due to the league enhancing itself across the spectrum: more soccer-specific stadiums, increased global awareness, improved on-pitch product, budding rivalries, exclusive TV deals, and — perhaps most importantly — a growing devoted fan base. I’ve talked at length about how impressed I’ve been with the improved atmosphere at MLS matches, and that is due in large part to the growing number of true supporters groups that show up for every match that their team. Some of these have gained some “notoriety” for their rabid support, such as the LA Riot Squad, Seattle’s Emerald City Supporters, Portland’s Timbers Army and Chicago’s Section 8. But there are countless others for each club that are present at every match banging their drums. Don Garber and Friends issued sanctions on Tuesday against Houston Dynamo’s supporters for their multiple violations of the MLS Fan Code of Conduct over the course of last season. Because of these violations, the Dynamo faithful such as the Texian Army are banned from bringing flags, banners, drums and confetti from away matches indefinitely (but probably just for the fist two away matches of the season). I ask you, how exactly is the all-too-rare MLS away fan supposed partake in healthy, competitive banter with their rival fans without such instruments? I suppose they can still sing, but that’s not exactly a skill that most MLS supporters groups have perfected yet… especially when only 20 of you can travel to fill the chorus in the first place. So what horrid indiscretions did these “hooligans” commit to deserve such harsh punishment from the league? They “ignited” illegal smoke bombs on three occasions (at FC Dallas, at Sporting KC, and at the MLS Cup Final in LA). There were multiple supporters using obscene language and gestures at the MLS Cup Final. They threw various objects that presented a safety risk thrown onto the field in the direction of players and stadium personnel, also at the Home Depot Center. Look, I’m all for MLS trying to protect its fans, players and personnel. But of those three violations, really only one warrants any sort of safety attention, and that’s items being thrown on the field. I’m by no means condoning this kind of action from fans, but punishing the entire fan base for a handful of unfavorables tossing plastic water bottles and a mini-flashlight at Landon Donovan is a bit overboard. There were plenty of Dynamo supporters in that section that not only paid for a ludicrously priced MLS Cup Final ticket and took a 28-hour bus ride to get there, but didn’t throw a damn thing. Why should they be punished for the acts of a few idiots? As for the obscene language and gestures, could you imagine the English FA attempting to police and punish these actions in the Premier League? Of course not. If so, you’d see away fans banned from every match. And while I don’t condone this behavior either, I’ll be the first to admit that I’ll drop an F-bomb or two during the course of every Tottenham match I watch… it comes with the emotions of being an invested supporter. fans that are willing to travel across the country to attend an MLS "independent supporters council" are not the ones you want to be punishing. And smoke bombs… well, I still don’t see why MLS has such a problem with these. Sure, they obscure vision and could possibly incite panic, but the open nature of most MLS stadiums means the smoke tends to clear quickly. They’re even creating a bit of a double standard on the practice, as they practically set off their own during significant matches. If they’re having problems with individual fans, use CCTV and match footage to identify the problem makers, and ban them individually. It’s not that hard, especially considering England already use this template to police their hooligans. The way it’s currently set up, it’s an all or nothing cut off that will ultimately hurt the league in the long-run. What MLS really has to remember about this situation is that these diehard fans are the lifeblood of this league. It’s not the Eurosnobs such as myself, who will only attend a few matches a year, that are going to help the league convert non-soccer Americans into fitba fans. Rather it’s these “superfans” that will be the ambassadors the league so desperately needs to grow the overall fan base. These are the fans that will inevitably drag some of their MLS-virgin friends to one of the many games they attend each season, and ultimately some of them will become fans themselves. Look, I don’t disagree with the league needing to deal with fan control and to deal with the limited number of hooligans amongst it’s devoted following. But if they end up alienating these fans, their biggest and most ardent supporters, the league could drive away their most valuable assets… the ones that pay your bills.